If great players are born, not created, then the genius inside Tom Finney’s frail frame stayed well-hidden as a schoolboy. The skinny little kid who kicked the toes out of his hand-me-down shoes on Preston’s Holme Slack playing fields was tricky enough. But as a 14-year-old, standing just 4ft 9in and weighing five stone, no-one took him seriously when he talked of being a professional footballer. Little Tom couldn’t even get into the Preston Town Team which went all the way to the final of the All England Schools Shield in 1936. He travelled to London for the showdown with West Ham, but only as reserve. And even when he wrote to North End asking for a trial, the Club noted his dimensions, ignored his letter – and very nearly lost their greatest-ever player. Dad Alf came to the rescue and, after an approach to trainer Will Scott over a pint in his local pub, the young lad got his try-out and so began Tom Finney’s fairytale rise to the very top of world football. For the next 24 years the most gifted player to pull on a Preston shirt dazzled, amazed and astonished audiences with his brilliance. He made mugs of some of the planet’s finest defenders with his sublime footwork. But he wasn’t just a wizard of the dribble, he created and scored some virtuoso goals for both PNE and England, played in all five positions on the forward line and in many people’s eyes became the most complete British footballer of all time. It was such a shame that Finney was 24 before he was able to make his league debut for Preston, six years and a World War after signing his first pro’ contract with the club. Had Hitler not intervened, football would have seen a lot more of his magic than the 472 North End games and 76 internationals he managed to cram in before retirement in 1960 at the age of 38. Finney was only 17 and training as a plumber when Europe was plunged into crisis. He played for PNE in regional football and even helped the club to lift the Wartime cup, beating Arsenal. But his call-up papers came during the 1941/42 season and off he went to spend the next three years fighting for his country in battle tanks while at the same time playing services football. Back on Civvy Street he returned to a mixture of mending pipes and training in an evening. When the Football League resumed after being suspended for seven seasons, Finney was champing at the bit and keen to make up for lost time. For all his incredible ability the Preston Plumber never won any of football’s major honours, a second division championship medal his only return from a glittering career, although becoming the first player to win the coveted Footballer of the Year trophy twice was some considerable consolation. Like the newspaper reporter on his debut, many said North End were too much of a one-man band and further ammunition for that argument came the season after Finney retired when PNE, without him, were relegated from the top flight. During his 14 seasons in the side Preston were the nearly men, finishing runners-up twice in the league and beaten FA Cup finalists once. That visit to Wembley in 1954 should have been a triumph for Finney, so influential was he for his country at the Empire Stadium, yet inexplicably he turned in one of his worst games in a Preston shirt and West Brom won 3-2. The maestro’s international career proved equally memorable, yet just as frustrating. He played in 76 of the first 101 England games after the War, was on the winning side 51 times and only tasted defeat 12 times. He scored 30 goals, a record in its day. Wembley was the venue for 16 of his international matches and he scored there five times. On the world stage he faced 23 different countries and played in 21. In 40 of his internationals he played in his favourite position on the right wing, but he also turned out 33 times on the left wing and three times up front as centre forward. 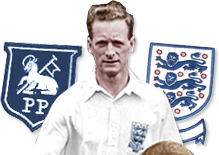 He played 21 times in the same England side as Stanley Matthews, but not once on the right-wing when the two were team-mates. Finney was selected for three World Cups – Brazil 1950, Switzerland 1954 and Sweden 1958 – but England failed to make a mark in any of them. A quarter-final place in 1954 was as good as it got, with England bowing out 4-2 to Uruguay in Basle. In the 1958 tournament, Finney played in the opening group game against the USSR, scoring from the penalty spot. But he was injured and took no further part in the competition as England drew both their two other games and then lost to the Russians in a pool play-off. With Preston having so many Scots in the squad during his time as a player, games against the Auld Enemy were keenly anticipated and Finney always seemed to raise his game for trips to Hampden Park. In fact he wasn’t on the losing side in any of his six visits to Glasgow with England, winning five and drawing the other. His 76th and final international appearance came at Wembley on October 22, 1958 when England beat Russia 5-0. Only 18 days earlier Finney had set a new goalscoring record when he netted his 30th in a 3-3 draw with Northern Ireland in Belfast. But he failed to add to it against the USSR, selflessly allowing Bobby Charlton to take a penalty. And when Nat Lofthouse made it 5-0 in the last minute he equalled Finney’s 30 goals! That act of generosity to a young Charlton typified Finney’s character. He was a true gentleman both on and off the field and was never booked nor sent off in his career, despite being targeted by defenders with orders to stop him at all costs. When it was finally time to hang up his boots at the end of the 1959/60 season, the whole of football stood to applaud the passing of an extraordinary talent. A persistent groin injury gave the iconic winger no alternative, yet for that last season he played in all-but five games and scored 21 goals. He was determined to bow out with a roar not a whimper. His final game came on April 30th, 1960 when Luton Town visited Deepdale. Preston ran out comfortable 2-0 winners and the greatest player the town ever produced thanked a near-30,000 crowd for their support throughout his career. It was tearful stuff. Outside football, Finney had a successful plumbing (hence the Preston Plumber tag) and electrical business started with his brother Joe after the War. He threw himself into that full-time, together with occasional stints as a football writer for the News of the World and also watching his beloved club from the stand. Within 12 months Preston were relegated and have never managed to get back up to the top flight in the 52 years since. For two decades he sat on the Preston bench – something he had never experienced as a player – when he worked as a magistrate. He was also the unwitting victim of TV’s This Is Your Life. He was made a Freeman of Preston in 1979, sat on the Football Grounds Improvements Trust and was appointed chairman of the Preston Health Authority. Sir Tom had the opportunity to see the workings of the health service from the other side in 1999 when he suffered a heart attack. But it was his wife Lady Elsie’s health issues which took over soon afterwards when she was diagnosed with Alzheimer’s Disease. As time went on she became more and more dependent on Sir Tom and he became her full-time carer. She died in 2004 just a few weeks before her 82nd birthday.